Over the past 20 years, World Golf Village has been developed and nurtured by builders, contributors and residents who truly understood the vision of this special community. For more than five years, Ron Savarese has been one of those valuable contributors. We recently caught up with him to learn more. Ron graduated from Franklin Pierce University in 1966 and joined the U.S. Army. After a tour in Vietnam, he taught fourth and fifth grades in Middleton, New York, and then pursued a more than 30-year career as a general manager and owner in the automobile business. 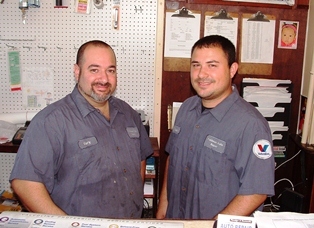 Upon retiring in 2004, Ron and his wife Gail moved from Southwick, Massachusetts right here to St. Augustine. 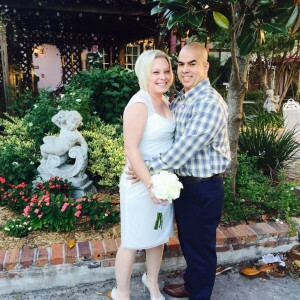 They immediately fell in love with the area and Ron joined Davidson Realty in 2008. Since then, he has been dedicated to cultivating strong knowledge of neighborhoods and homes in and around World Golf Village. Take a Virtual Tour of Turnberry in World Golf Village! 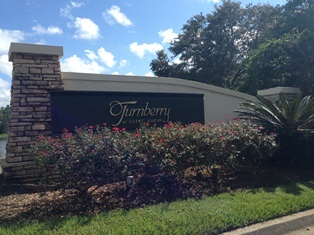 Well-located and stocked with amenities, Turnberry is an exceptional community located in The Neighborhoods of World Golf Village (Slammer and Squire Neighborhoods) comprised of 217 homes. It’s conveniently located one mile from I-95 in the acclaimed St. Johns County school district. Children living in Turnberry are zoned for A-rated schools, like Mill Creek Elementary School, Pacetti Bay Middle School and Allen D. Nease High School. Turnberry offers its residents affordable single-family homes, excellent public schools, neighborhood amenities, and gorgeous lake and preserve views. Join Davidson Realty agent Debra Pappas and me as we tour Turnberry! 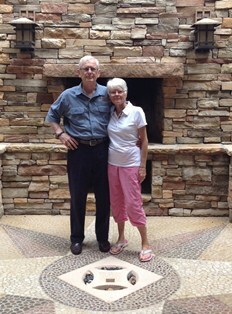 For a couple who thought they would never leave the Washington D.C. area, Allan and Audrey Freed are now among the biggest fans of living in World Golf Village. It’s been seven and a half years since the Freeds moved into Turnberry and Audrey Freed recently answered a few of our questions, including exactly how they ended up in our neck of the woods. We call Lynn Whitley, a Davidson Realty Agent and Turnberry homeowner, a “Super Resident” because she takes advantage of all that World Golf Village has to offer, almost on a daily basis. The best way to get to know Lynn is to take a glimpse at how she spends her day. So we asked Lynn to tell us in her own words how she spent an average work day and we tagged along to snap some photos. My day started with coffee and breakfast at home in Turnberry, then a quick ride to the fitness center at the King & Bear. When the weather is nice, (which is most of the time for us St. Augustine residents), I get some extra exercise by riding over on my bicycle, since it is only about four miles from where I live in Turnberry. A morning workout gives me energy to power through my day. 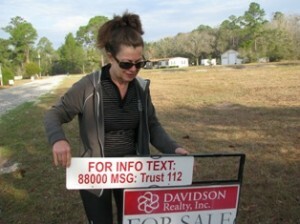 At Davidson Realty, we are doing away with flyer boxes and using new technology (texting) for potential buyers to get information on our listings sent to their mobile phones on-the-spot. I stopped at my listing on Sluder Estates Lane on the way home from my workout and removed the flyer box, relocated my name rider to the bottom of the sign and added the texting rider to the sign.